All systems designed by Forestaire take advantage of our fully equipped workshop and service division that operates in the industries that we build systems for. We are able to take advantage of the valuable feedback from our customers and technicians. This allows us to design systems that are extremely robust and reliable, high performing and field serviceable. All components used in the design of our systems are industry standard. If we are unable to provide the ultimate solution for any specific application, we are able to design specific components that will more than meet our customers’ requirements. Given that Global warming and ozone depletion are catch phrases of the 21st century in our industry, this has a very real effect. Worldwide, temperatures have increased and in the southern hemisphere our skies are clearer and the sun loading is a very real issue. All system capacity calculations include these parameters; evaporator and condenser assemblies are designed to handle the most extreme temperatures possible with performance and reliability as the main criteria. This coupled with a need to fulfil the customer’s requirement from an aesthetic and accessibility standpoint means we are able to satisfy any application. Forestaire has a full in house manufacturing capability in both sheet metal and engineering. We are able to handle small to medium production runs as required and have off site capability if necessary. All assemblies manufactured by Forestaire are built to an extremely high standard given the robust requirement of the applications. Generally, construction is from electro galvanised steel, powder coated for corrosion resistance and aesthetics, or from stainless steel panel for its long term corrosion resistance and life, with the exterior finish to suit the customer’s requirements. All components used in the manufacture of our systems are industry standard proven in the application by long term field exposure. Evaporator and heater coils, copper tube and alloy fin, are generally supplied by Red dot. These along with condenser fans and blower assemblies, predominantly Spal, Tripac and Aurora, are used based on their technical specifications and the application required. Condensers are the single most important component in any a/c system. Forestaire use solely Red Dot product in this area. Each application is individually assessed and calculated to provide the best heat rejection possible given the space allowed and then the condenser is selected to provide the best performance. Whether this is a tube and fin, multiflow, serpentine, remote fan or radiator mounted condenser, the individual characteristics of each is considered prior to selection. All bracketry is integral in itself, and provides a secure mounting platform with no stress on the condenser or fittings. Preferred compressors are Seltec, Diesel Kiki, Sanden or Denso. As with all other components, the selection of compressor type depends on the application, performance required, space available, and the most suitable configuration. Our choice of hose is generally Goodyear Galaxy, in both standard and reduced hoses. We use Atco steel bump tube o’ring fittings, however Parker, Aeroquip and Manuli hose and fittings are available to meet certain OEM parameters if required. All ancillary components are generally Red Dot. International supply and availability, coupled with superior quality and reliability make this the only option. All systems manufactured by Forestaire are built to perform in the harshest conditions. Our systems are already working in some of the most severe environments from mining applications in the Pacific, Airport Fire appliances throughout the Australia, molten alloy crucible transport in aluminium smelters, to forestry harvesters operating all over New Zealand. Given that we have designed and manufactured the system, it is logical that we carry out the installation. With over 20 years experience in this field, our installation guarantees the performance that has already been manufactured into our systems. Component mounting brackets, hose mountings and protection, unit installation and wiring are all areas where our expertise counts. With a fully mobile installation service that has carried out installations in Australia, the Pacific, and from Invercargill in the south, to Whangarei in the north of New Zealand. This service is available to any customer who requires it. 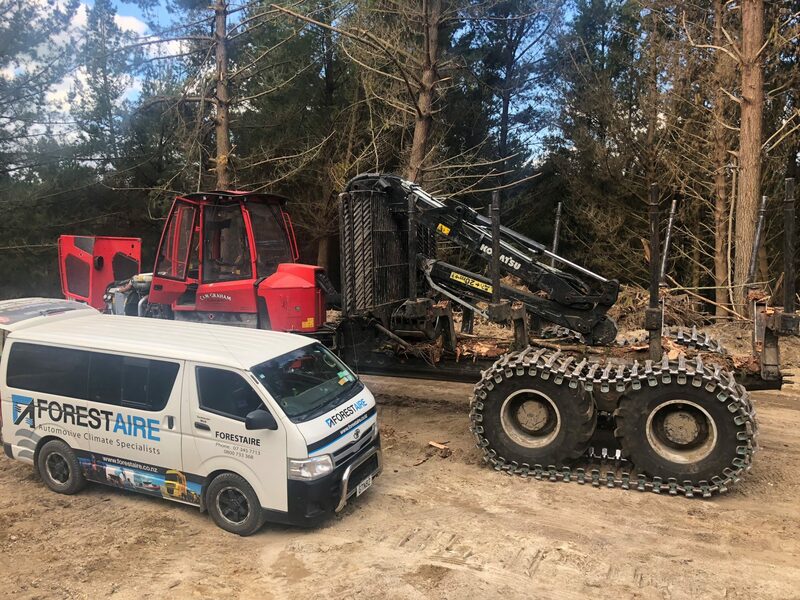 Forestaire has a fully mobile service fleet with 4 fully equipped service vehicles operating out of our purpose built facility in Rotorua and our satellite branch in Tauranga NZ. We are able to provide full back up service within the central and upper north island, and through associate companies, provide our customers coverage throughout New Zealand. We also offer service to our international customers by arrangement.